Dr. Borrego specializes in engineering education research. 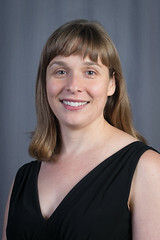 She has been awarded National Science Foundation grants to study factors that support successful transfer of Hispanic engineering students from two-year to four-year institutions, engineering undergraduate student resistance to active learning, how engineering instructors make decisions about their teaching, learning in graduate engineering research groups, interdisciplinary education and teamwork. Dr. Borrego is a member of the Graduate Studies Committee for STEM Education and holds an appointment in Curriculum & Instruction. She previously served as a Program Director at the National Science Foundation and an associate dean and director of interdisciplinary graduate programs. Her research awards include U.S. Presidential Early Career Award for Scientists and Engineers (PECASE), a National Science Foundation CAREER award, and two outstanding publication awards from the American Educational Research Association for her journal articles. Dr. Borrego is an Associate Editor for Journal of Engineering Education and serves on the board of the American Society for Engineering Education as Vice President for Professional Interest Councils and Chair of Professional Interest Council IV. All of Dr. Borrego's degrees are in Materials Science and Engineering. Her M.S. and Ph.D. are from Stanford University, and her B.S. is from University of Wisconsin-Madison.